If your a regular reader of this blog you will find that I love nothing more than to discuss the serious and at times messy topics of art therapy and mental health. But I have decided to start a regular addition to my posts in the form of a creative activity. I’ll annotate activities, recipes and ideas with emotion related titbits and variations. I am hoping these activities offer something practical for parents, caregivers and anyone who spends a lot of time with children. Creative activities for children help them develop fine motor skills, sequencing and problem solving abilities and encourage development in imagination, sensory processing and confidence. The playful, fun and creative aspects of childhood are often the most essential to development. So without further rambling, my first activity to share is a classic- Play dough! While I had grand plans to test a whole range of play-dough recipes and then tweak them until I had the ultimate recipe, I was in fact saved by The Imagination Tree. Anna’s award winning blog is all round amazing and I definitely recommend it as a resource. I love this recipe in particular because it is no-cook, soft and lasts a long time (like months and months). It is the only one I use. I usually keep play dough in ziplock bags to keep it fresh, but you could use an airtight container. I have used the recipe without glycerine and it is still is the best recipe! There are so many variations to play dough to add a little glitz and glamour. Try adding natural materials (dried flowers and leaves), sequins and glitter, herbs and spices, or a few drops of essential oils. Play dough is a multi-stage process which means it is a great holiday activity for children who are learning how to follow methods and sequences. Involve your child in the whole process from purchasing ingredients, following the recipe (careful with hot water! ), collecting variation and add-on materials and then playing with the end product (for hours)! Play dough can also be a great “calm down” activity. 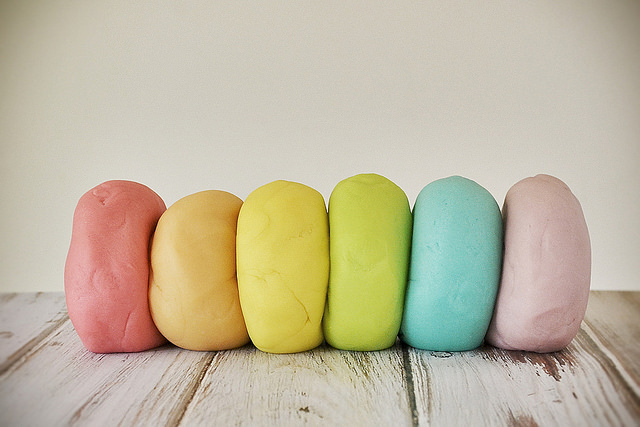 Play dough engages both the mind and body as it requires imagination and physical input. Rhythmic and sensory activities are great to soothe the nervous system and there is usually a lot of kneading, cutting, rolling and shaping involved in play dough play. The fact that play dough is smooth and non sticky means that it provides lots of tactile sensation without being overwhelming. If you are making a batch of play dough to be used in a clam-down box or as a tool to try for sensory regulation, try adding a few drops of lavender essential oil. Lavender is well known for it’s calming qualities; you could also try another scent that your child likes or finds comforting such as jasmine or sandalwood.